It all started with a farm owned by the Bragaw family, French Huguenot settlers who purchased the land from the Dutch in 1713. They named their estate ‘Sunnyside Hill’ because the property afforded them breathtaking views of the sunrises and sunsets. Sunnyside Hill and other area farms were occupied by British forces during the Revolutionary War. 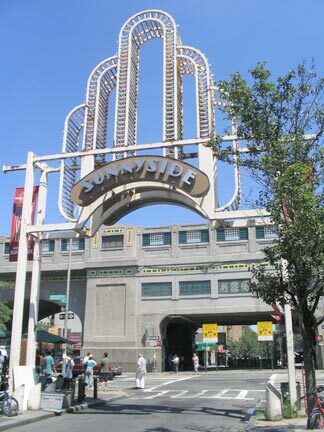 It was the ‘Sunnyside Hotel,’ built nearby, that started the ball rolling in the development of present-day Sunnyside, Queens. 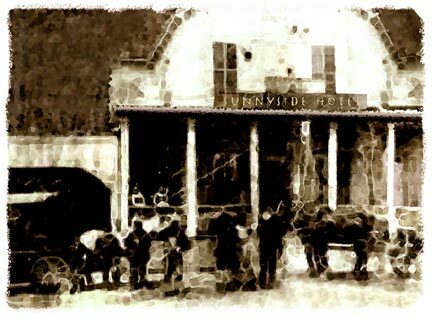 Named after the adjacent farm, the hotel opened in the 1840’s near what would be Webster and Jackson Avenues (now 37th Ave. and Northern Boulevard). Its clientele was mainly visitors to nearby cemeteries. From 1854 to 1866, it also catered to patrons of the National Race Course in Corona (renamed ‘Fashion Race Track’ in 1856). 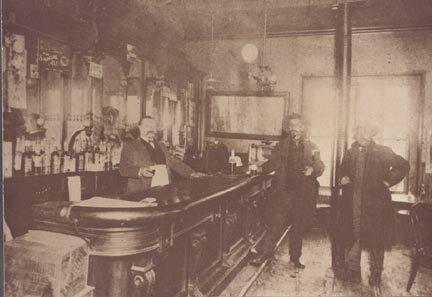 In 1875, the White Line (the Newtown and Flushing Railroad) of the LIRR opened its ‘Sunnyside Station’ across the street from the Hotel. Unsuccessful, the White Line was abandoned in 1876 and replaced with horsecar service in 1877. Transportation took a step backwards, and development of the surrounding lands was hampered for a while. 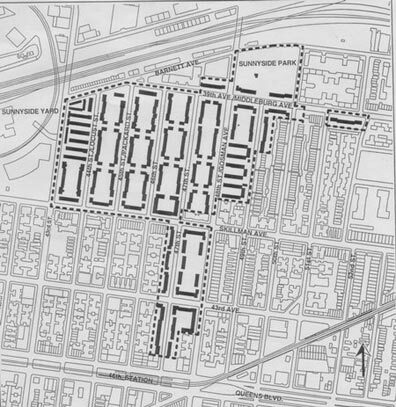 A scattered community of houses, farms and inns sprung up between Northern Boulevard and Queens Boulevard during the late 1800’s. 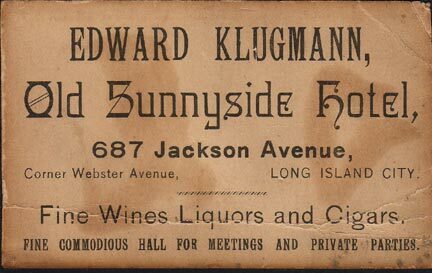 In the early 1900’s, Sunnyside was nicknamed ‘Nuisance Land’ by people who traveled through the area on their way to and from the better-established town of Woodside to the east. The small hotels and businesses along Skillman Avenue (thought to be pictured in the background of photo at left) catered to hunters who came to hunt in Sunnyside’s woods. Small ponds dotted the landscape, making the land a prime location for duck farms. In 1902, The Pennsylvania Railroad started buying up property south of Northern Boulevard, leveled the land and filled in the ponds and swamps. In 1909, the Queensboro Bridge was opened. 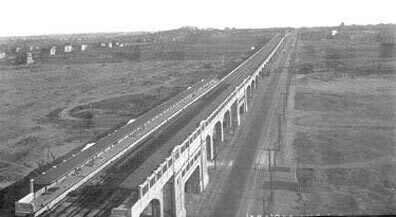 In 1910, the Sunnyside Railyard was built, shifting the community to its present location. 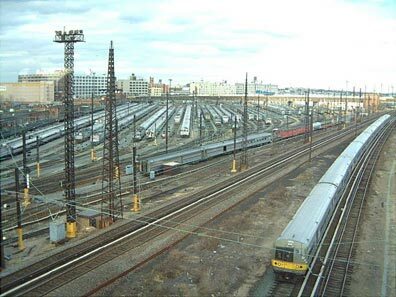 Michael Degnon was the contractor for the Steinway Tunnel, the first rail link to connect Manhattan and Queens, and also the contractor for the Sunnyside Yards. He decided to build his own railway, called Degnon Terminal, adjacent to the Sunnyside Yards and constructed large factories and warehouses complete with sidings facing the railroad tracks. This was attractive to his clients, since shipping goods via rail was now more accessible and less expensive for them. Some of the Terminal’s early clients were Sunshine Biscuit Company, Packard Automobile Company, American Ever Ready Company, and American Chicle Company. Of course, the rising cost of doing business in New York forced all of these companies to find other cities in which to manufacture. The sidings haven’t seen rail traffic since 1989, and the tracks are now either paved over or overgrown with weeds (some of which can be seen on FNY’s Disappearing Railroad Blues page). In its heyday, Degnon Terminal employed 16,000 workers. 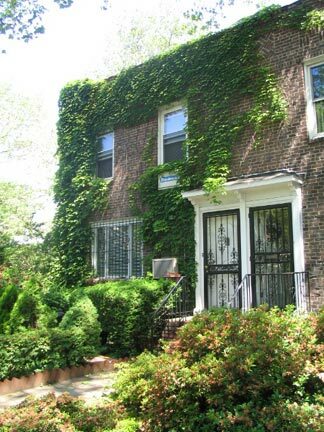 As Queens farmers went the way of the dinosaur in the early part of the 20th century, they subdivided their property and sold it as small residential lots. The extension of the elevated subway (today’s 7 train ) through the area in 1917 made Sunnyside very attractive to middle and lower middle class workers. 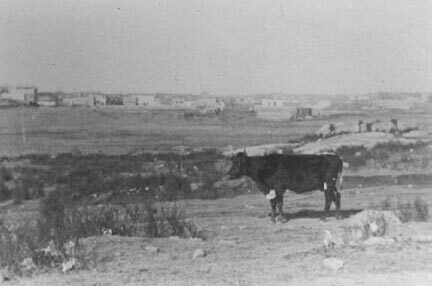 Within 10 years, the entire area pictured at left was built up, mostly with residences. 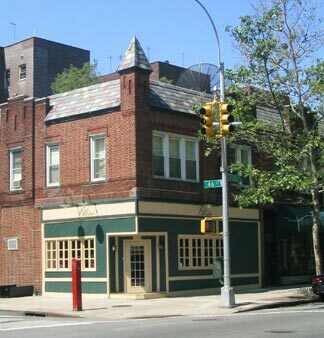 In 1922, ground was broken at 48th Street and 47th Avenue for Sunnyside’s first apartment buildings. 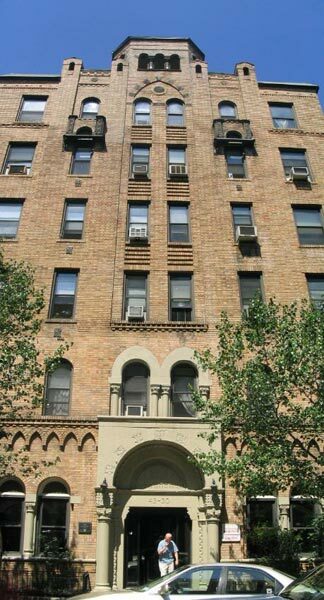 The Metropolitan Houses were built by the Met Life Insurance Company for low-income families. When the company sold the property, the complex was renamed ‘Cosmopolitan Houses,’ which it remains today. Part of it continues to serve as federally subsidized housing. The design of the Gardens was novel in that large areas of open space were included in the plan. Construction costs were minimized, which allowed those with limited means the opportunity to afford their own homes. 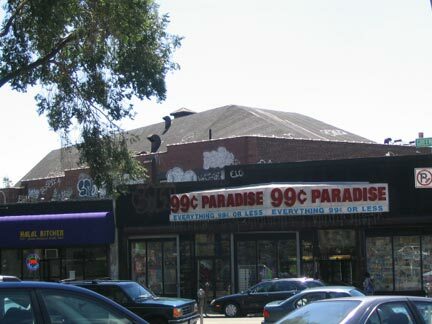 Rows of one- to three-family private houses with co-op and rental apartment buildings were mixed together and arranged around common gardens, with stores and garages placed around the edges of the neighborhood. Just about every interior window in the Gardens offers a view of a landscaped commons. A great Garden shot can be seen on PBS’ Walk Through Queens. Cornell University has an interesting aerial view of the Gardens. Founder Lewis Mumford [the long-time architecture critic at The New Yorker–your webmaster] was also one of the Garden’s first residents. 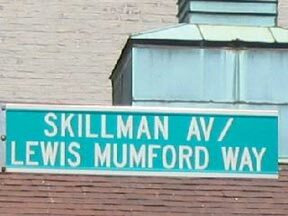 The part of Skillman Avenue that runs through Sunnyside Gardens has been renamed in his honor (left). Original street names have been restored in the Sunnyside Gardens Historical District. Carolin, Gosman , Heiser and Fitting Streets were named after area farmers who once owned the land. “A City Housing Corporation survey of homeowners in 1928 counted 184 blue collar workers (mechanics, chauffeurs, restaurant workers) and 355 white collar workers, including tradesmen, salesmen, government employees, teachers, social workers, lawyers, and doctors. Artistic residents of the Gardens included painter Raphael Soyer, singerPerry Como and actress Judy Holliday. 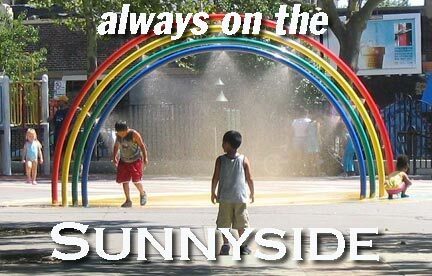 Crooner Rudy Vallee, NYPD Blue actress Justine Miceli, “Rhoda’s mom” Nancy Walker, and tough-guy actorJames Caan also lived in Sunnyside. Sunnyside Gardens Park is privately owned by the residents of Sunnyside Gardens. The park, opened in 1926, is maintained by its members. It’s a 3-acre private park, but not exclusive. Anyone willing to pay $162 per year (2005 fee) and complete 12 hours of volunteer work may become a member. 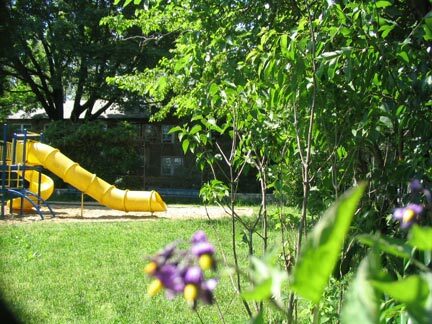 There are recreational facilities, including baseball fields, tennis courts, a wading pool, and woodlands with grills and picnic tables. 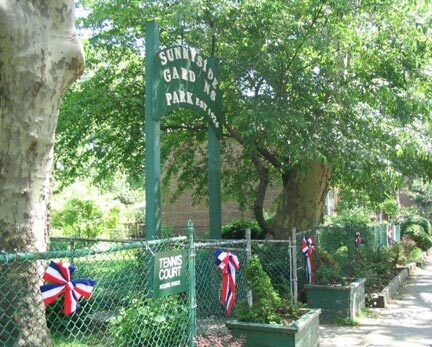 Sunnyside Gardens Park is one of only two private residential parks in the city. The other is Gramercy Park in Manhattan, which is much more elite and whose owners would probably scoff at the idea of extending access to outsiders. 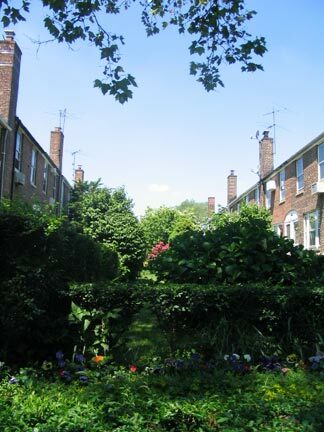 The Gardens is comprised of 1,202 housing units on 55 acres of land. The community has been recognized for its innovative design and has special zoning regulations that protect it from being altered. In 1984, Sunnyside Gardens was placed on the National Register of Historic Places. Residents are now hoping to get a stricter city landmark designation that would prevent any further changes to building facades and common areas. 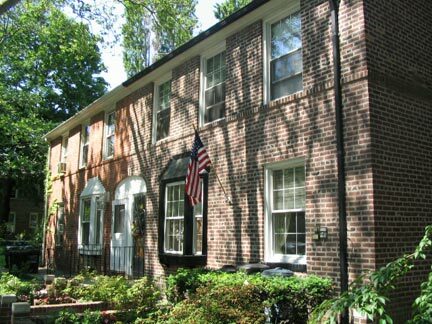 Following Sunnyside Gardens’ lead, the Phipps Houses Group, owned by Henry Phipps, a partner of Andrew Carnegie, built the Phipps Garden Apartments in Sunnyside which consist of large rental apartment buildings situated around a central garden area. This complex has also achieved national landmark status. Photos of the Phipps Apartments are included in the album linked at the end of this page. 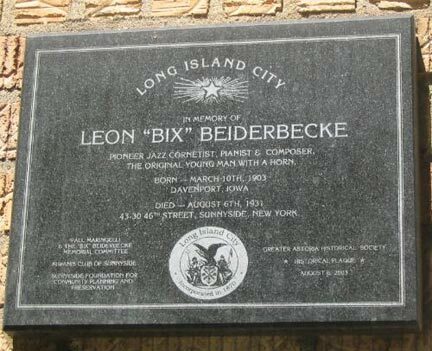 A wall plaque honors the memory of Bix Beiderbecke, jazz cornetist extraordinaire, who lived briefly and died here of alcoholism and pneumonia on August 6, 1931 at the tender age of 28. The plaque was installed in 2003 at a candlelight vigil dedicated to his memory. 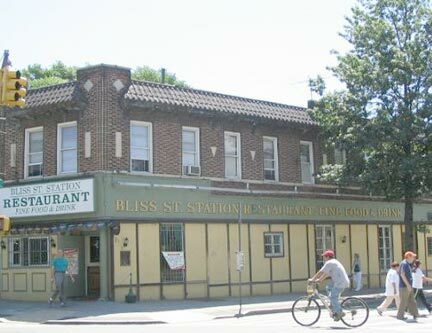 Bliss Street Station Restaurant is on Greenpoint Avenue. The name actually pays homage to 46th Street Station’s old moniker. 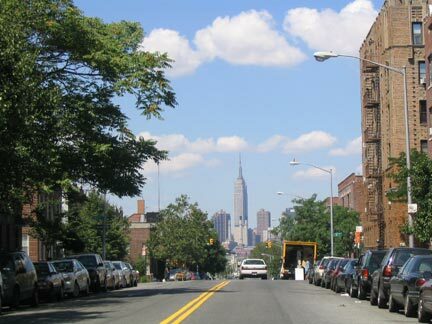 Neziah Bliss, for whom this street was named, is profiled on FNY’s Laurel Hill and Blissville page. Queens Boulevard in Sunnyside — one of the few places in Queens where you just might be able to hail yourself a yellow cab… The el has served as inspiration for many of Sunnyside artist Simon Donikian‘s paintings. 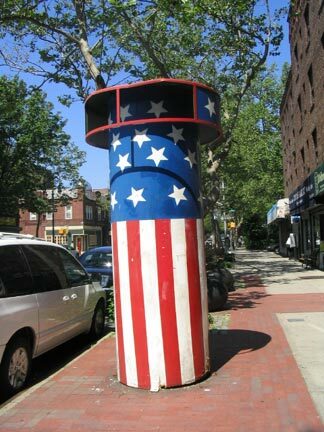 This kiosk is rather decorative and appropriate for the summer holidays – as well as for a post-9/11 New York. 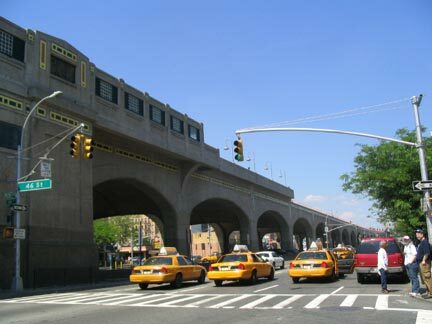 Sunnyside’s most recognizable landmark is the Sunnyside Arch at 46th Street and Queens Boulevard. It was erected years ago by a now-defunct community group, and received a $450K facelift in early 2005. 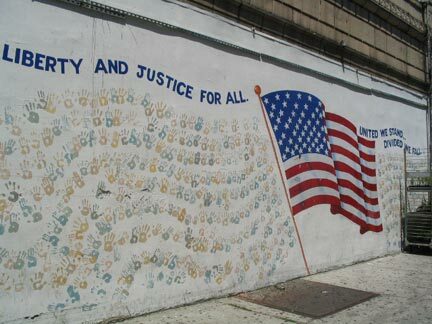 A patriotic mural off of Greenpoint Avenue decorates the wall of Klein’s Florist. 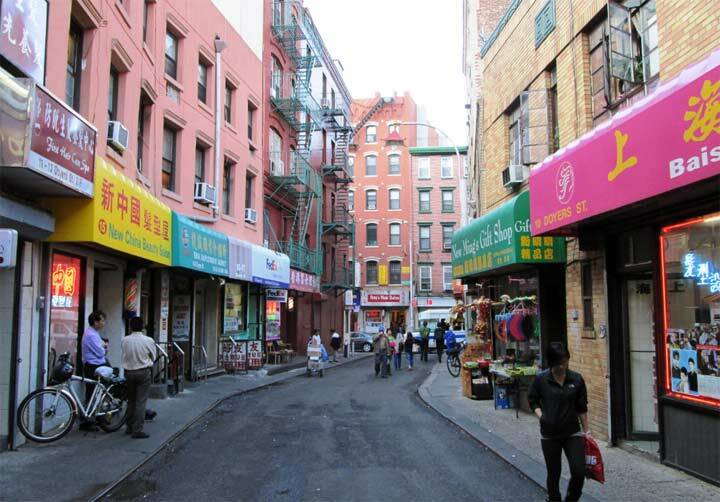 Notice the different color hands – Sunnyside is a true melting pot as it is home to one of the most ethnically diverse populations in the city. 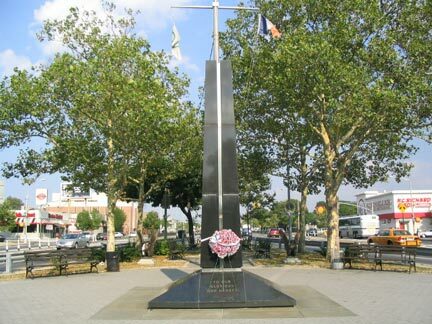 Joe Sabba Park, previously known as Sunnyside Veterans Triangle (previously known as Roosevelt Plaza), sits on an island in the middle of Queens Boulevard at Roosevelt Avenue. It is named after local war veteran and community activist, Joseph Sabba, who passed away in 1999. 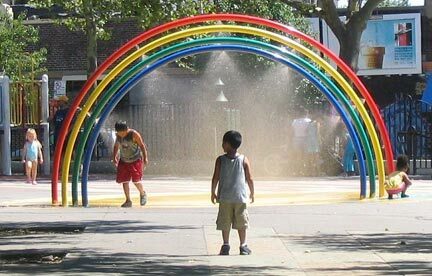 Under the rainbow on a sultry summer Saturday atLance Corporal Thomas P. Noonan Playground, bounded by Greenpoint Avenue and 43rd Street. Noonan was posthumously awarded the Congressional Medal of Honor for his heroism during the Vietnam War. The playground was formerly known as Thomson Hill Park. 17-year-old Sandra Thorp, the future mom of Forgotten Fan Henry Kuck III, strikes a pose at Thomson Hill Park in 1958. 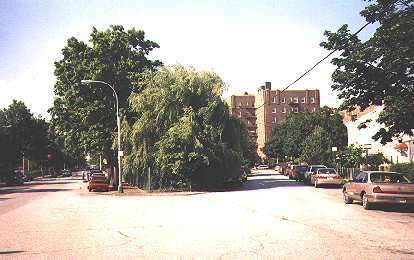 Thomson Hill was once the name of this part of Sunnyside, which lies south of Queens Boulevard. 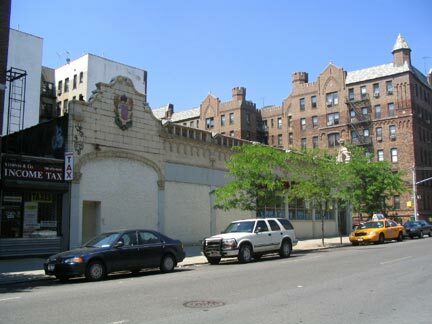 Much of present-day Queens Boulevard runs along the road previously known as Thomson Avenue. The westernmost end of the original Thomson Avenue continues to lie between Jackson Avenue and Van Dam Street. James Thomson, for whom the street was named, was a real estate speculator who purchased several farms at Hunter’s Point in the 1860s. 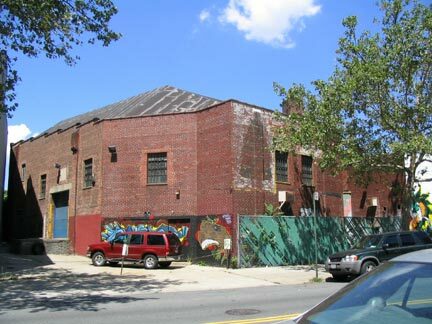 This building on Greenpoint Avenue is now a Jehovah’s Witness Hall, but was once the Bliss Theater, which opened in 1931 and closed sometime in the 1960’s. 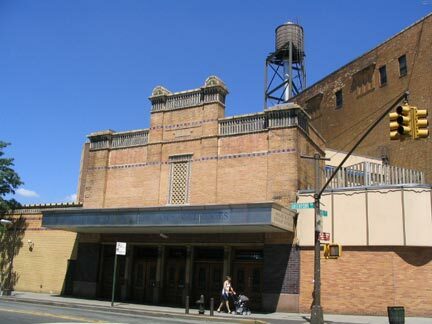 Another area movie house was theSunnyside Theatre, which ran features on Roosevelt Avenue and 51st Street from 1926 to 1961. Unfortunately, the building was totally demolished in 1965. 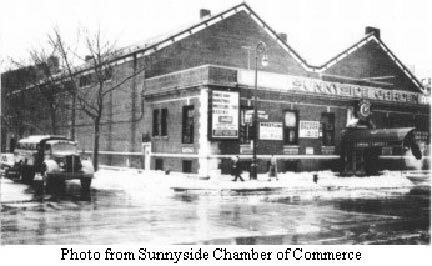 The Sunnyside Garden Arena stood at the corner of 45th Street and Queens Blvd. It had quite a history, which is detailed on the Sunnyside Chamber of Commerce’s website . The movie Mr. Universe was filmed there in 1951. In 1960, future president John F. Kennedy made a campaign stop there. A fast food joint has occupied the site since 1977. This is part of a commerical strip along Greenpoint Avenue between 42nd and 43rd Streets. Notice the high, angled roof top behind the storefronts. Here is the structure from another angle. The building has served as a warehouse for Nelson’s Christmas Shoppe. But from 1938 to1950, it was the auditorium of the 43rd Street Theatre. 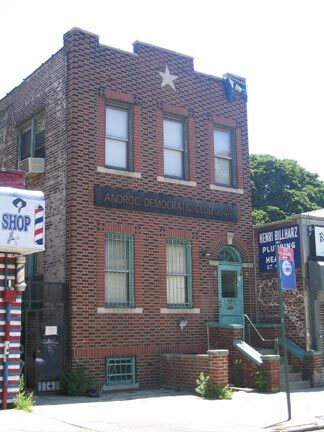 The Anoroc Democratic Club has been at this location on 47th Street since 1925. ‘Anoroc’ is simply ‘Corona’ spelled in reverse and was chosen by its members for its “Indian sounding” name. Check out this old photo. 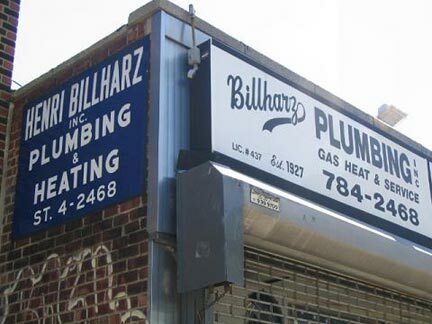 Billharz Plumbing is next door to the Democratic Club and, as the sign says, they have been snaking Sunnyside’s sewers (try saying that three times fast) since 1927. Three generations of plumbers later, business is still as strong as it was before that old sign sporting the alphanumeric exchange was hung decades ago. This particular branch of a chain pharmacy is quite fancy. The ornate carvings along the top reveal its past as a 1930’s-era Child’s Restaurant. The building is along 43rd Avenue. In the 1940’s, Childs merged with Sonnabend Operated Hotels to form the Hotel Corporation of America. The company sold most of the old restaurants soon after the takeover. Today the corporation is known as Sonesta International Hotels. More neighborhood photos are available in my Sunnyside slideshow. Special thanks to Bob Vogel for the railyard photo, Henry Kuck III, former Sunnyside resident, for his assistance and Bob Singleton of the Greater Astoria Historical Society for use of their facts and photos. The photographs for this page were taken on June 4th and July 23rd, 2005 and the page was completed on September 12th, 2005 by award-winning Forgotten NY correspondent, Christina Wilkinson.